Today's second dive was to continue helping Georgia collect water samples for her Weedy Seadragon eDNA PhD project. We were going to cover the ground between The Steps and Big Rock. Hopefully, we'd also find a few Weedy Seadragons. We got in at The Steps and descended to the sand/kelp. The visibility was still 10 to 20 metres and the water temperature around 23°C. There was barely any surge. As we swam towards the sand line I looked for Weedy Seadragons in the kelp and anglerfish on the rocks. We headed towards Big Rock along the sand line. When we reached the rock where the Pot-bellied Seahorses used to be I suggested that Georgia take her first water sample. I have seen weedies in this area. We continued along the sand line. 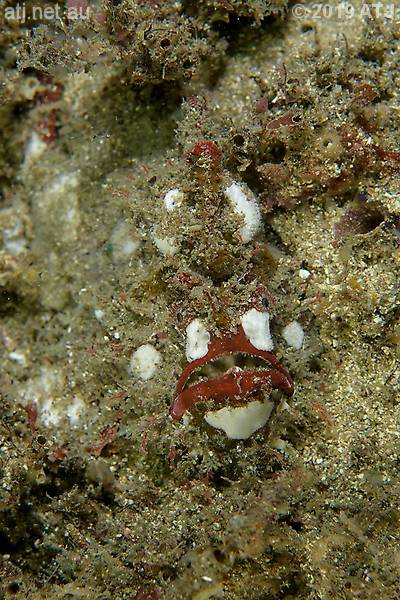 I looked in the hole for pipefish but could not see any. I stopped to look in the red algae at the spot where a pair of red Stigmatopora sp. pipefish had been. Georgia spotted a juvenile Weedy Seadragon and it was time for her second sample. I took some photographs of the juvenile but accidentally kicked up the sand and ruined the photographic situation. I vowed to come back on our return. We followed the sand line to large yellow Red-fingered Anglerfish (that is now off white). I took some photographs and pointed it out to Georgia again. We swam up to the large rock behind Little Big Rock. I found "Petra" in much the same spot she'd been on the first dive. "David" was in the sea tulips. We continued on to Diversity Rock. I indicated that here would be another good spot for a water sample. I often see Weedy Seadragons around Diversity Rock. I looked without success for the white Red-fingered anglerfish. We followed the reef towards Big Rock. We stayed up a bit from the sand line but we could still see any weedies that might have been there. We headed up past Sponge Hollow and on past the rock where the one eyed White's Seahorse had been. We'd seen a weedy in this area yesterday and I hoped it was still around. I was trying to think of a way of telling Georgia that I'd seen one here yesterday when she spotted it. I took photographs and Georgia took another water sample. We headed to Hand Rock. I found the small female under the hand sponge where it had been on the first dive. I took some photographs and pointed it out to Georgia, again. We went over to Big Rock and I looked for pygmy pipehorses hear the sea tulip. I spotted the female straight away but it took me some time to find the male. We swam up to the rock behind Big Rock with the different sponges. George's orange Red-fingered Anglerfish was out in the open where it had been on the first dive. We headed back towards The Steps on the top part of the reef. We stopped at the basket star. 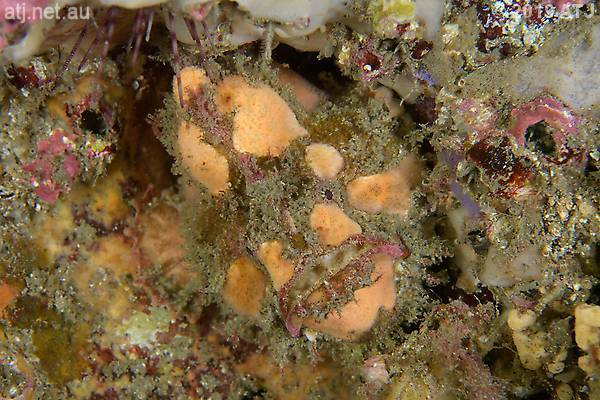 I then had another look for the white Red-fingered Anglerfish around Diversity Rock. I spotted it embedded on the rock just up from where I'd seen it yesterday. 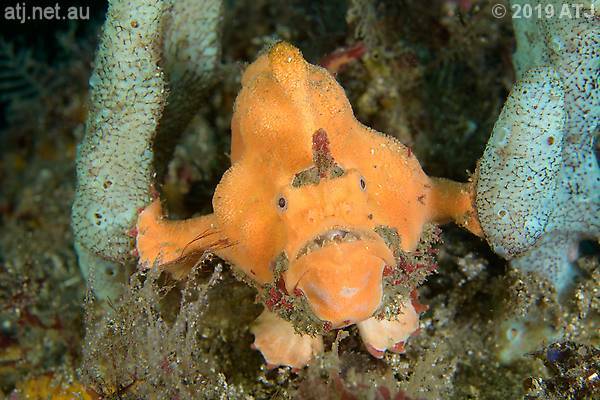 Red-Fingered Anglerfish, Porophryne erythrodactylus. 12.7m. We continued on to Little Big Rock and the Pot-bellied Seahorses. They were both in the same places they were earlier on the dive. We followed the sand line past the large yellow/off-white Red-fingered Anglerfish and on to the juvenile Weedy Seadragon. It was in the same place as earlier in the dive. I took some more photographs and this time I was careful not to kick up the sand. We headed up from the sand line to look for the other two Red-fingered Anglerfish. We swam past Di's Rock and on to the rock where the large orange anglerfish had been yesterday and today's first dive. It was still hanging out under the side of the rock. 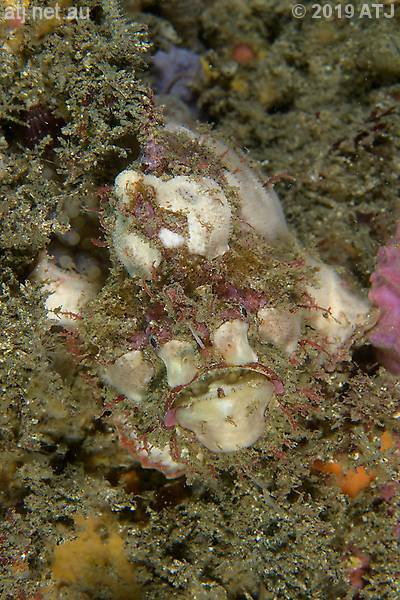 Red-Fingered Anglerfish, Porophryne erythrodactylus. 11.6m. As we were swimming to the other anglerfish we spotted a small Giant Cuttlefish. It is probably the same one from the previous dive. I found the rock where the small orange Red-fingered Anglerfish had been and then the anglerfish itself. It had moved slightly on the rock. 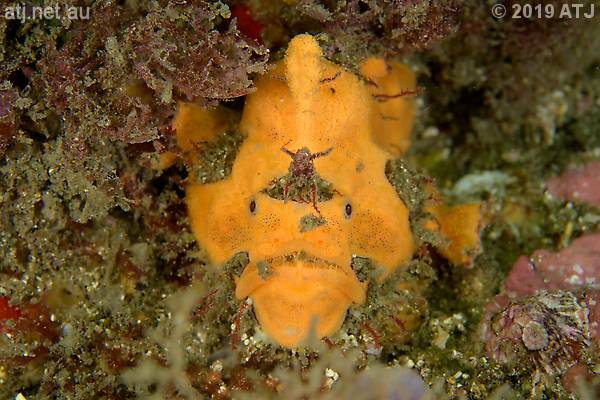 Red-Fingered Anglerfish, Porophryne erythrodactylus. 9.6m. We headed to the boulders and ascended to 5 metres and started our safety stop. 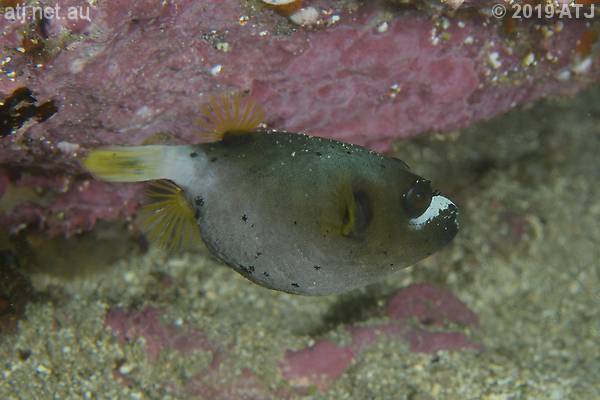 As we were approaching Split Rock I spotted a small Black-spotted Pufferfish. This was only the second I have seen in Sydney. I managed to get a couple of photographs before it disappeared into the boulders. 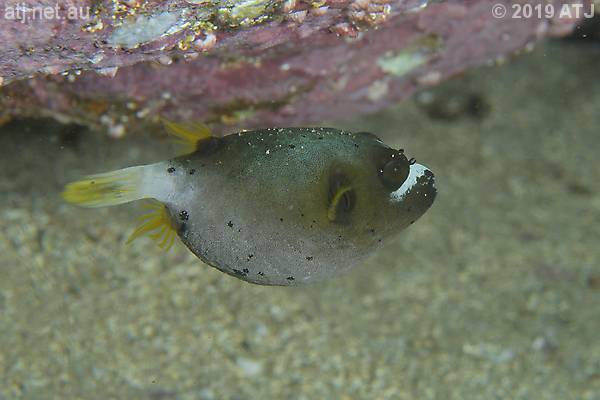 Black-spotted Pufferfish, Arothron nigropunctatus. 6.3m. We finished our safety stops and headed for the exit. I stayed underwater right to the exit. It was easy to get out.